"The Taking of Funtime One Two Three"
The Belchers have proven over and over again that they can scheme, especially with Louise at the helm and a group of rag-tag Wagstaffers in the mix. But never before has an episode gone full Oceans 11-style heist like tonight’s episode did. From the initial plan to the assembling of a crew with a particular set of skills to the twists and turns in the final act, “The Taking of Funtime One Two Three” made 22ish minutes of animated television feel like a thrilling and fun full-length heist feature. It all starts with the quest for a dune buggy at the local non-Wharf arcade, Funtime. The prize is going for 10,000 tickets, and in an attempt to win it Louise discovers the scams that keep arcades and carnivals from losing their top prizes: machines marked “out of order” after giving out too many tickets, games rigged to technically be winnable but only with a certain amount of force, lower tier prizes with no batteries included. 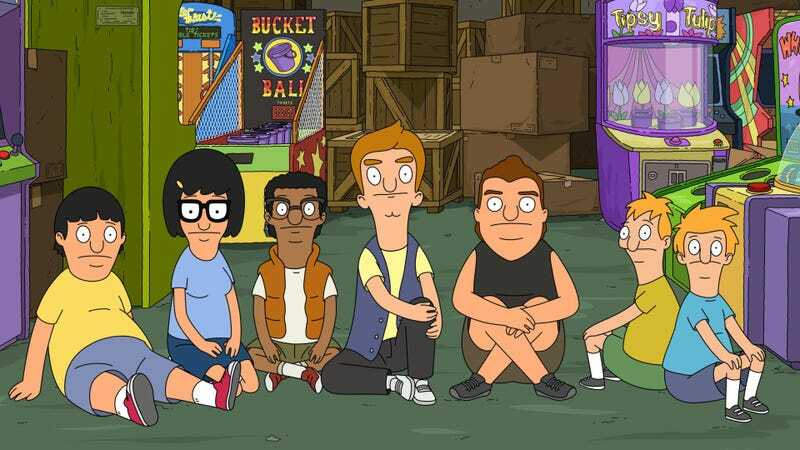 After a happenstance meeting with Mr. Fischoeder (they’re both asking Bob and Linda for more money), the Belcher kids team up with the landlord to take down Funtime and win the dune buggy. The parallels between Louise and Mr. Fischoeder and Louise are little bit chilling. They’re both manipulative, but for different reasons, both power and money hungry in their own way, and both perfectly charming even when being threatening (except, of course, when Louise really loses it). Watching them pair up makes it easy to picture Louise’s own life as an obscenely rich, enterprising property owner, but one who is more pure of heart and likely won’t make Bob and Linda pay rent. Speaking of Bob and Linda, they remain blissfully unaware of their children’s adventures, distracted instead by a chicken given to them by Teddy so they can enjoy freshly laid eggs. It’s very interesting how Bob’s Burgers animators illustrate animals. While the humans in this world are very cartoonish and exaggerated at times, every time there’s an animal in an episode it’s drawn very lifelike in a way that makes it adorable to look at and even more humanizing than some of the other characters. That’s the case with this chicken, who has a glint in its eyes that makes it hard to hear Bob and Linda discussing the poultry recipes they’ve been thinking up. Back at Funtime, when Louise goes in for one final walk-through she gets caught and banned from the arcade, throwing a classic late-in-the-plan wrench into the entire heist. The show, however, goes on, and when Fischoeder and Louise reveal each of their double-crosses in turn, I genuinely gasped a little bit. I should have seen it coming, it’s a classic heist-movie ending, but I was so wrapped up in the story as it unfolded (and those spot-on split screens while detailing each moment of the heist) that I was able to experience the full satisfaction of the twists. This show has successfully played with genre before in a way that still feels true to the world of the show and not too gimmicky. 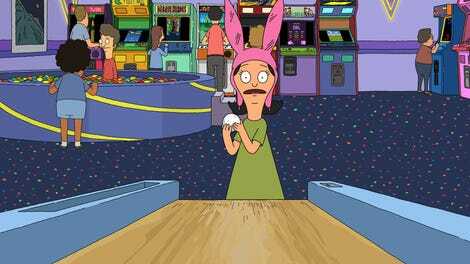 But this episode has achieved that balance in perhaps one of the most seamless ways yet, showing that even nine seasons in this Bob’s Burgers can still be full of surprises. Burger of the day: all I could make out was “We won’t ...uette(baguette?) ...led again.” Did anyone catch the whole sign? I found myself moving my head around as if I could peer behind Bob and see the whole thing.